in positions where they can best use their entrepreneurial skill sets to succeed. 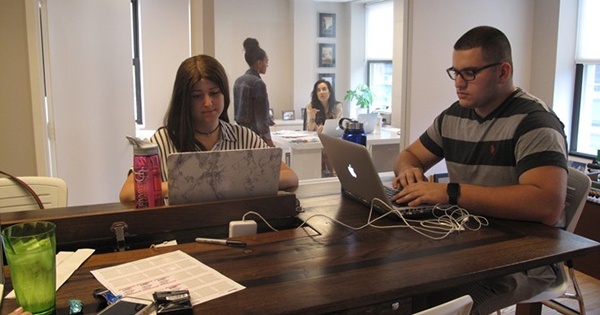 Adam Polansky, 2018, and Jodi Stern, 2019, were employed by Social Media Link, a brand loyalty and community building company in New York City, while Matthew Chen, Fall 2017, worked for Jet Support Services Inc. (JSSI) in Chicago. “Jodi and I have been part of the inside sales team, focusing on outreach to grab new companies and bring them into the fold,” said Polansky of his Social Media Link work experience. “Our goal is to create consumer networking and a sense of community by using brand ambassadors who are actually loyal to the brand and product instead of just serving as walking billboards,” added Stern. Ted Foltyn, an adjunct faculty member with Horn Entrepreneurship, led the program through its first successful summer. The program hopes to expand as connections grow and relationships become stronger. More than just helping students find real work experience catered to their skill sets, the program provides the chance for Horn Entrepreneurship to grow by word of mouth within the business community. “Beyond students, the program benefits Horn Entrepreneurship by giving us more exposure to companies who may not know much about us,” said Foltyn. All three students added their appreciation for the opportunity. “Horn Entrepreneurship and Ted were incredible in finding and placing me in a position built for my entrepreneurial strengths,” said Chen. “Ted really helped connect both of us to Social Media Link,” said Stern. “He has given us the confidence and skills to be successful in interviews. It has been a great experience and an awesome opportunity from Horn Entrepreneurship,” Polansky said.